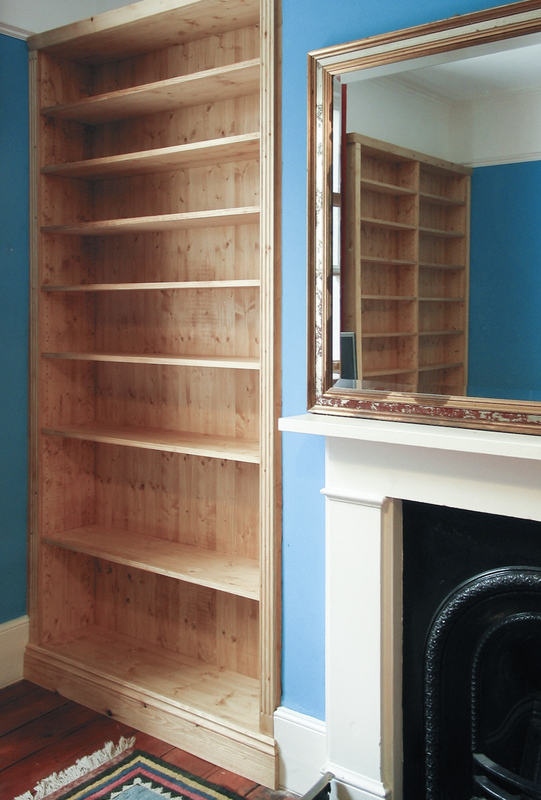 Here we have built a traditional 'break fronted' shelving and storage unit for a living room in a period property. This will have a hand painted finish and some traditional knob type handles fitted. Sometimes less is more! 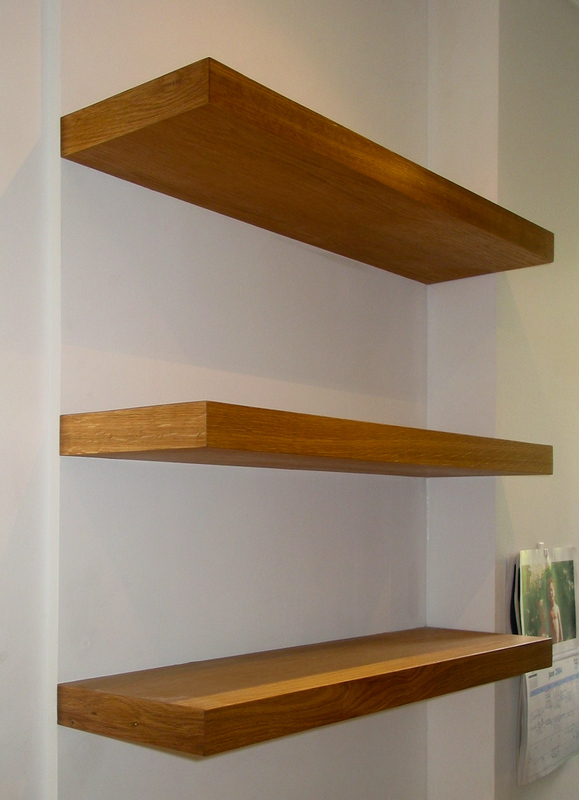 Three simple floating shelves in oak really compliment the white walls to give a lovely light contemporary feel to any room. 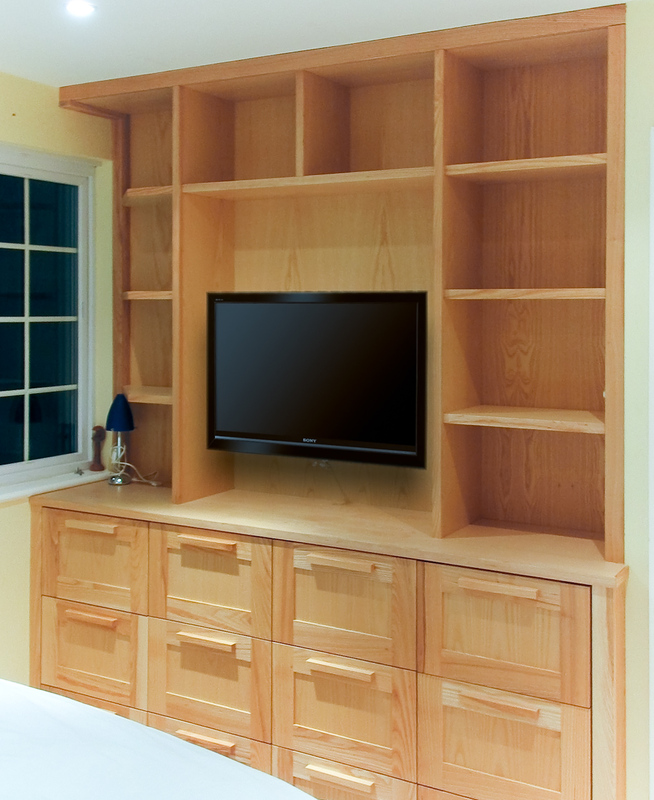 This is a bedroom shelving and cupboard unit shown here in solid maple wood, designed to accommodate large drawer storage on soft closing runners, open shelving for books and a centred alcove for the flat screen TV. 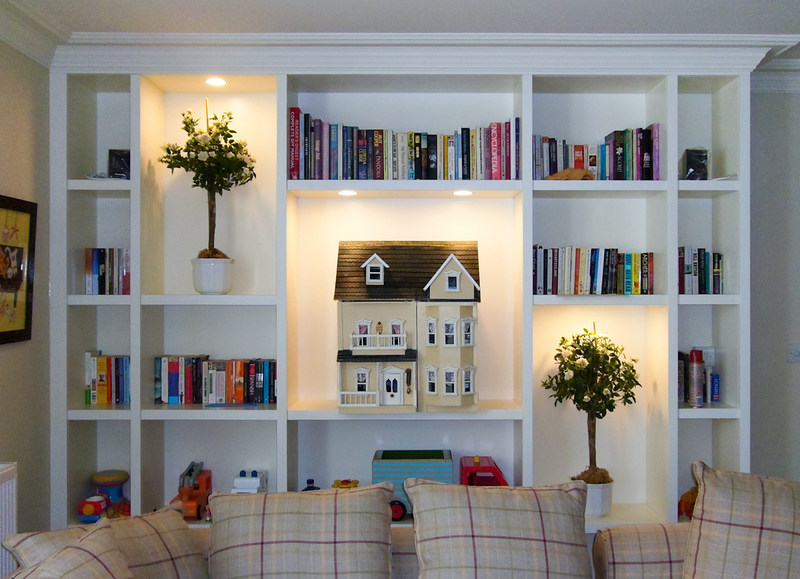 We have designed this piece specifically to incorporate our client's art display as well as book shelving. Just ask to find out what we can do for you! Shown here in a white satin spray lacquer finish. Traditional solid pine bookcase. 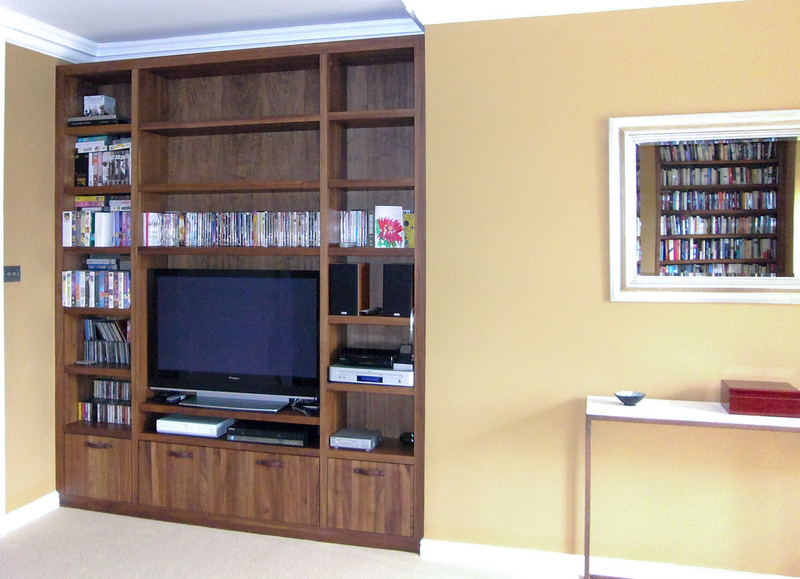 This unit has been matched to other existing pine furniture, made to fit perfectly within the alcove and professionally installed by our own fully trained professionals. 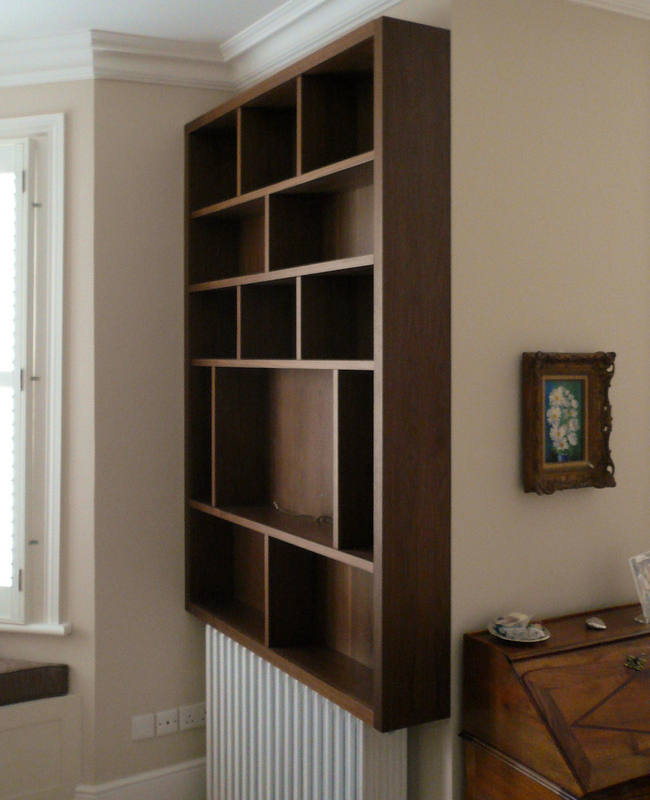 This storage and bookcase cleverly incorporates a drinks cabinet and glasses. 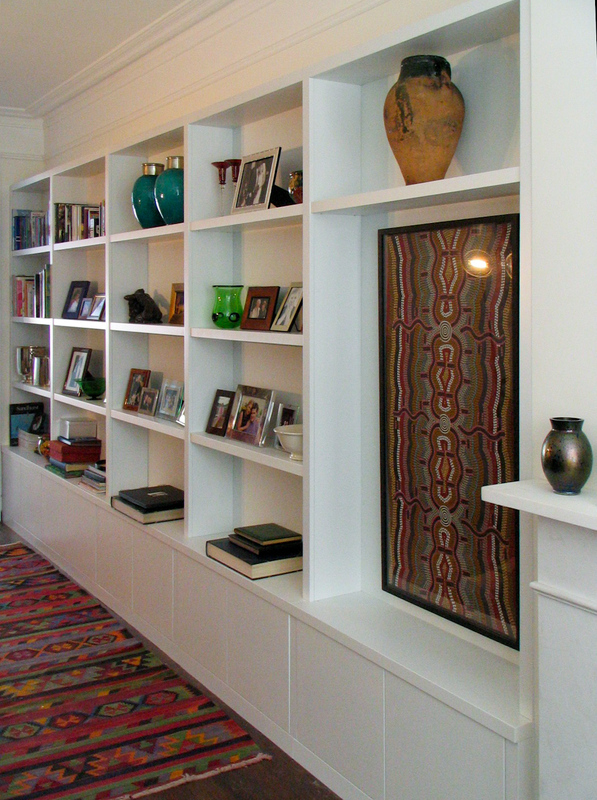 The corner shelves at the end avoid seeing a large cabinet side avoiding that bulky feel. Simple but effective! Stylishly designed contemporary shelving with the added design feature of 'brick pattern' effect shelf dividers and open media shelves below. 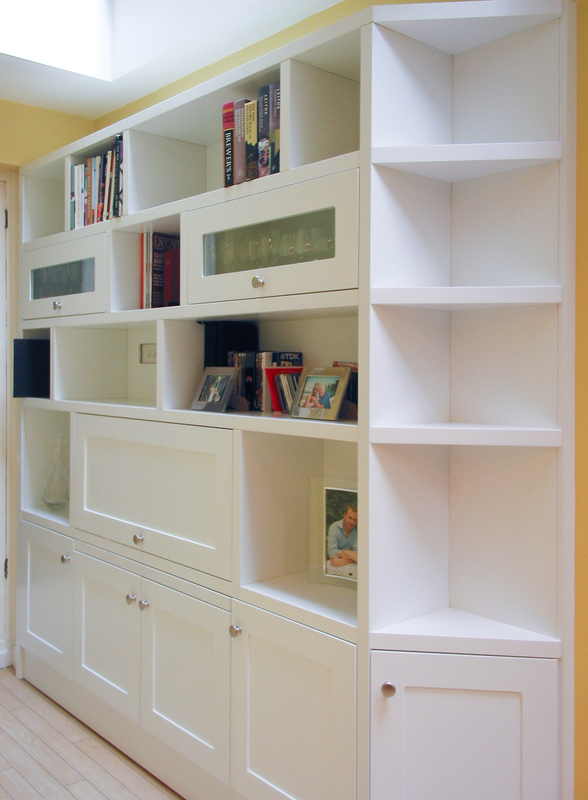 Shown here in a satin white spray lacquered finish. 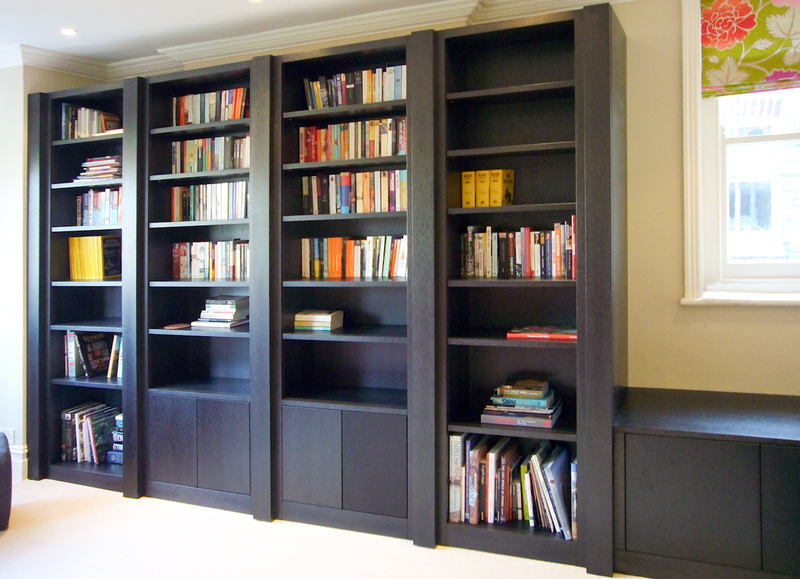 This home study shelving unit oozes opulent elegance with its chunky columns and beautiful black stained oak. We also built a matching desk with a black glass top. This style can come in any of our wood or colour range. Light airy and well balanced design is also very functional with the first shelf incorporating a drawer for remote controls etc. The lower units are suspended off the floor. Shown here in the ever popular walnut. Modern simplicity at its best. 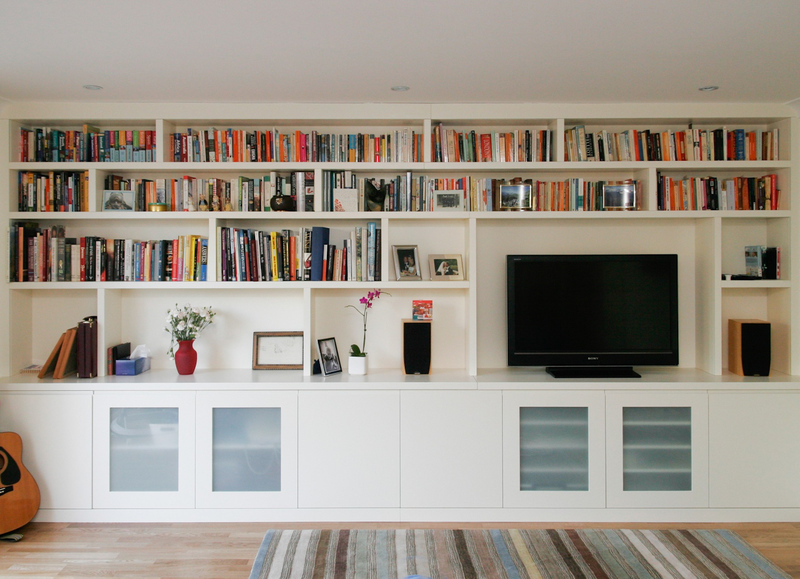 Once filled with books, this home library will provide a massive amount of book storage without the bulky lines of a more traditional bookcase. 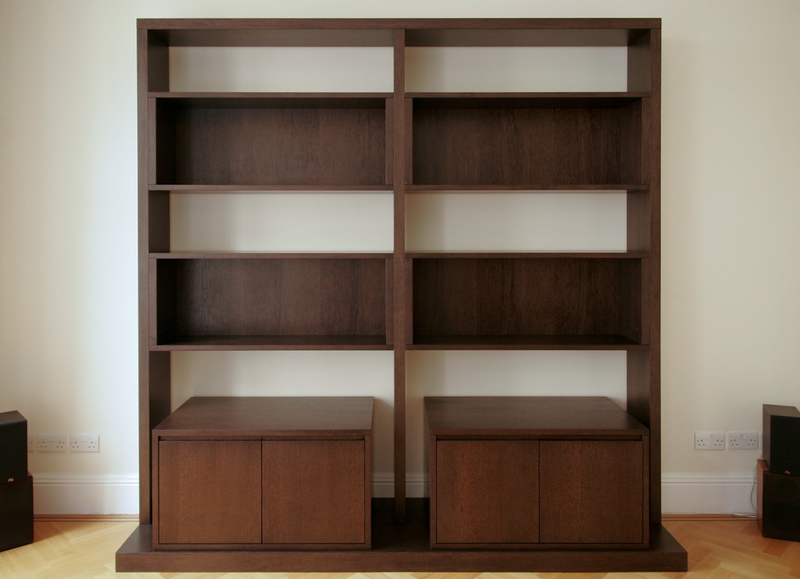 These corner floating shelves are shown here in walnut. 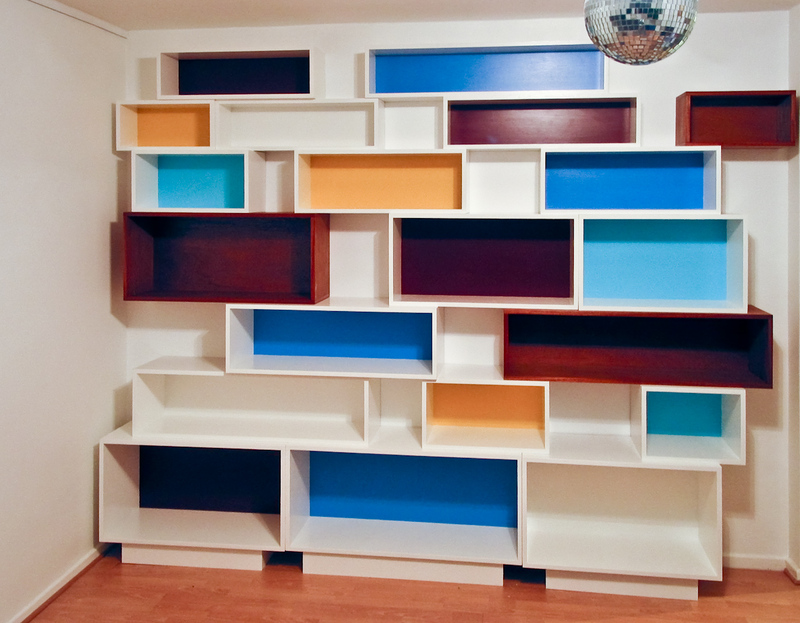 How about this for loft space shelving with a difference. 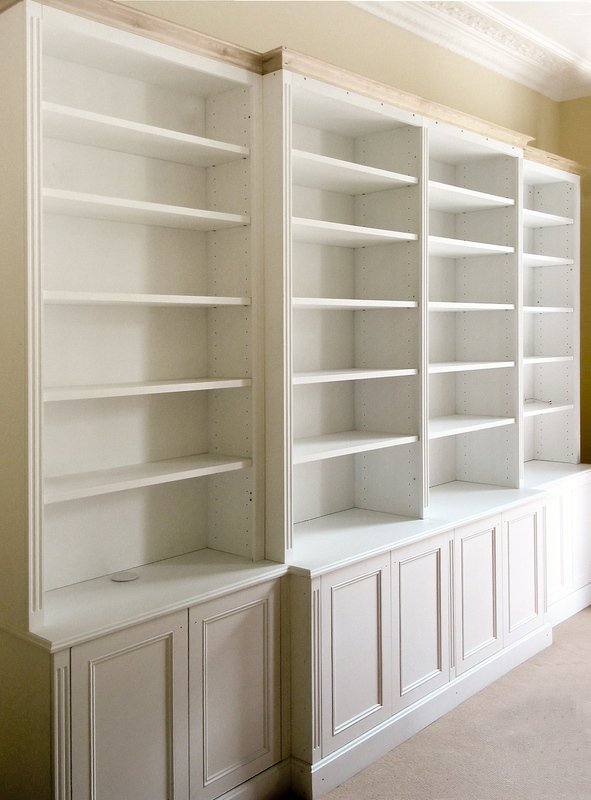 Imagine this unit full of books and display items; it will look even more sensational. 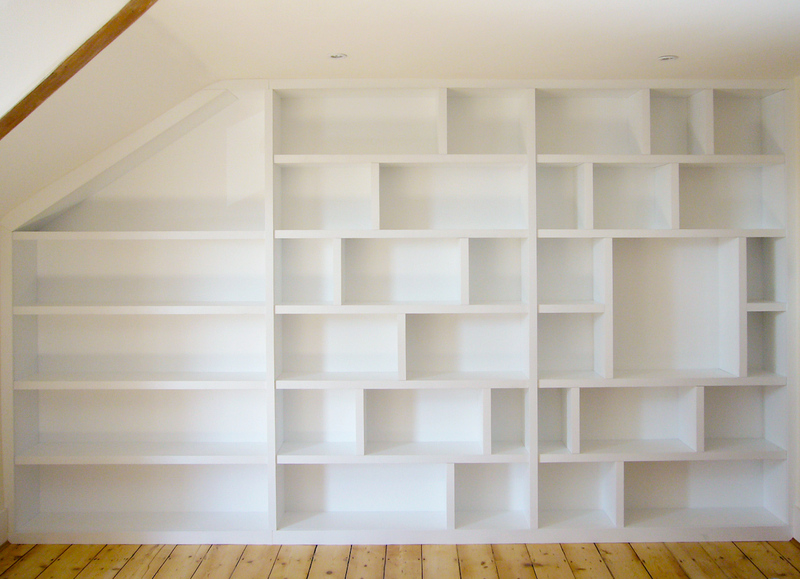 We can arrange this kind of shelving to fill any space or room shape and can be in a colour or wood of your choice. The architectural layout of this living room display cabinet will make it the centrepiece of the room once it is has a tall vase and some pieces of sculpture on show. Shown here in wenge. 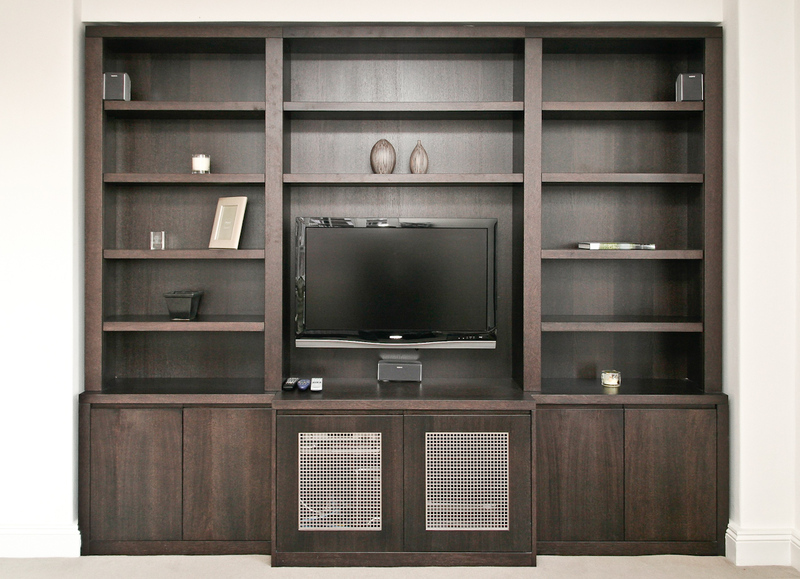 Contemporary shelving and home entertainment unit shown here in walnut. Handles are in leather. 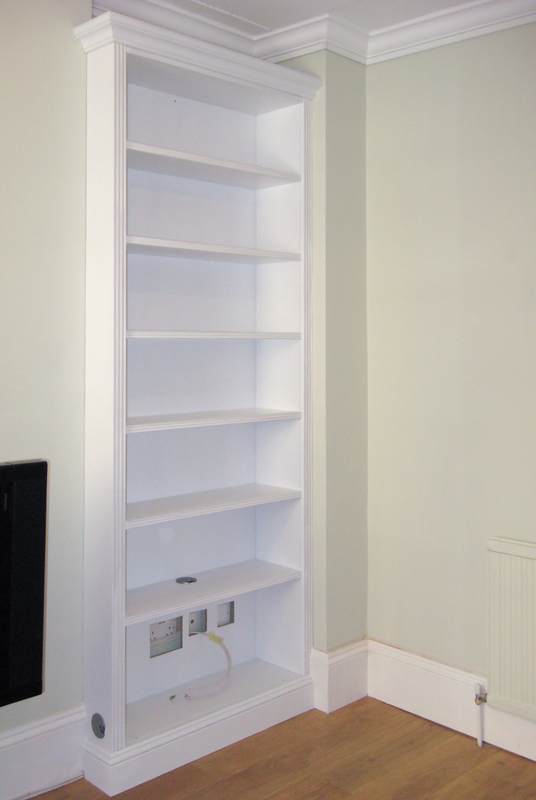 A more traditional piece, this bespoke alcove shelving unit will accommodate an audio system and plenty of books! This is in a hand painted white finish. Here we have a free standing but custom made loft cabinet for a family room. 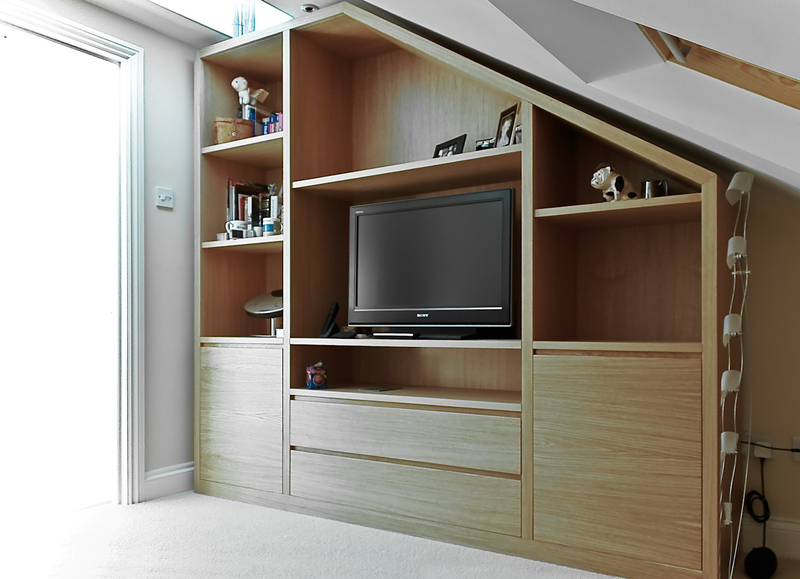 Shown here in oak, it has been designed to allow a perfect balance of storage behind closed doors and open shelving. 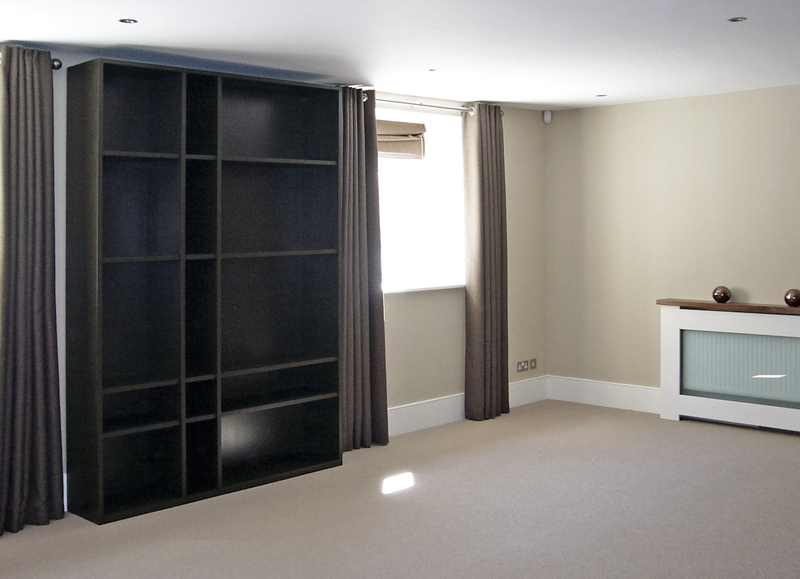 We have provided cable access so that the DVD player and Sky box are neatly hidden behind closed doors. Simplicity at it's best! 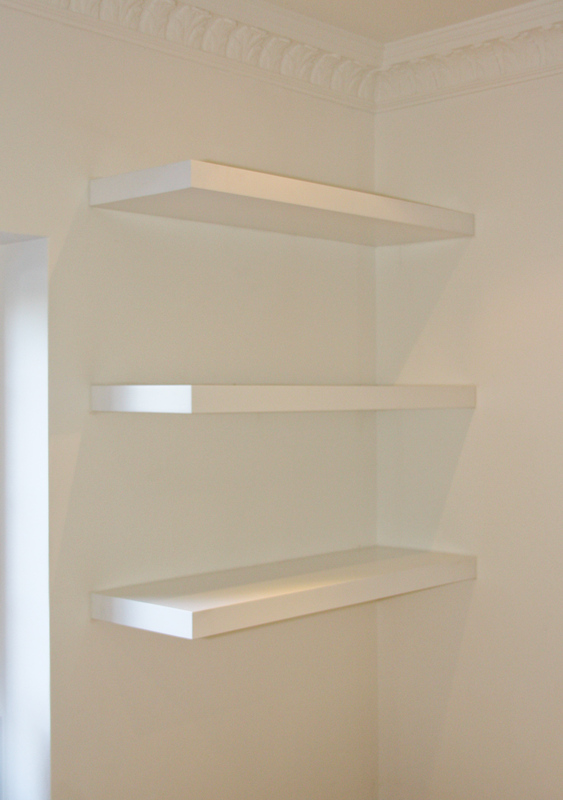 Three floating shelves which have been custom made and fitted to achieve a seamless effect. Shown here in a hand painted white finish. 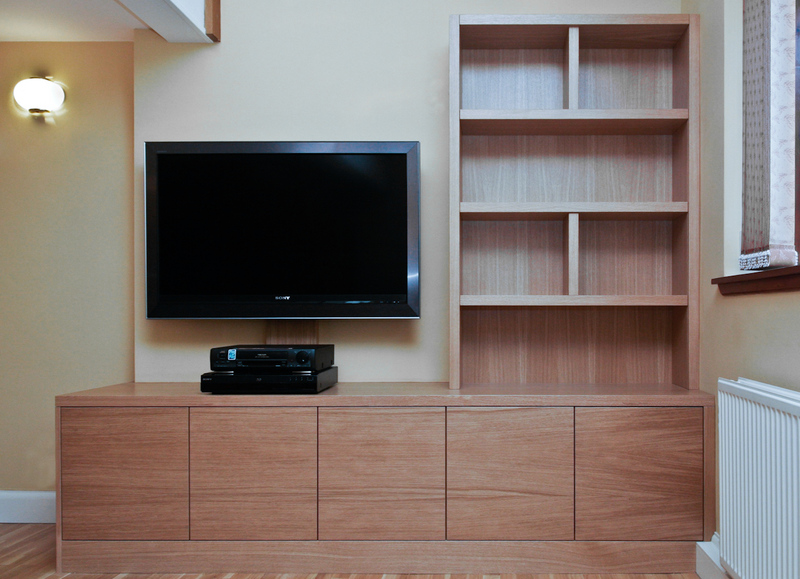 Shown here in light oak, this shows that a home entertainment does not necessarily need to be symmetrical to look great. In this case the TV was centred to the sofa rather than the wall. This contemporary style cabinet has been built to fit from floor to ceiling so that it neatly hides an unsightly beam running across the ceiling. 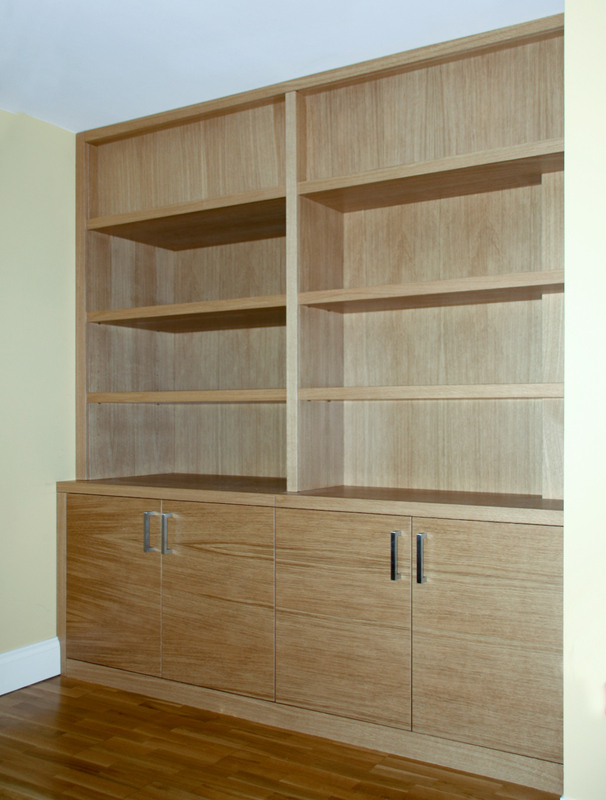 Shown here in a light oak veneer with the grain running horizontally. 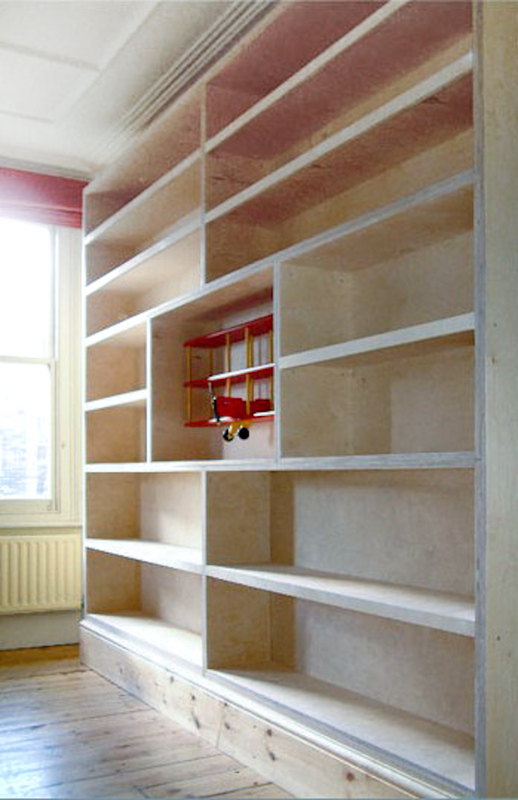 We have personalised our clients shelving to incorporate a child's pride and joy. Why not let us make a centre piece of one of your treasures! 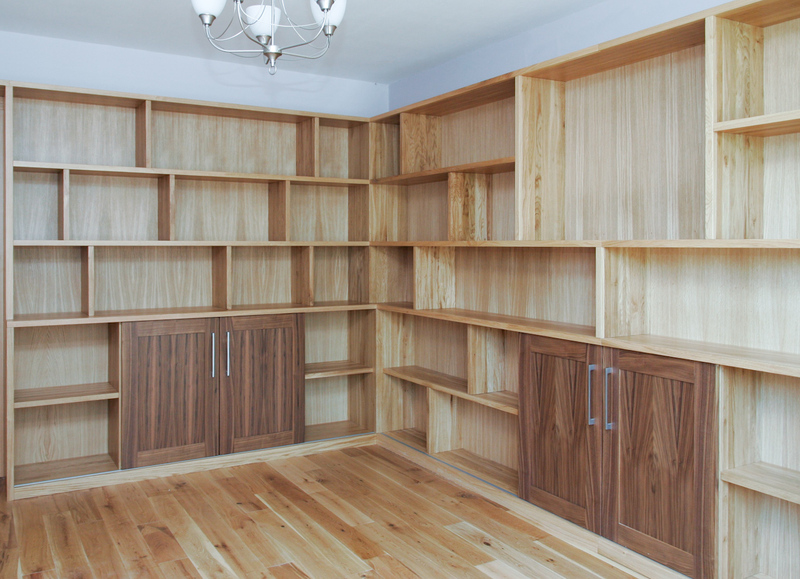 This fabulous arrangement of library shelving for the home study has been designed in such a way that it does not feel like rows of shelves because of the randomly placed dividers and the walnut sliding doors that conceal the electrical equipment contrast well with the light oak shelving. This designer bespoke piece will make an exquisite feature to any home. Shown here in a dark stained oak. 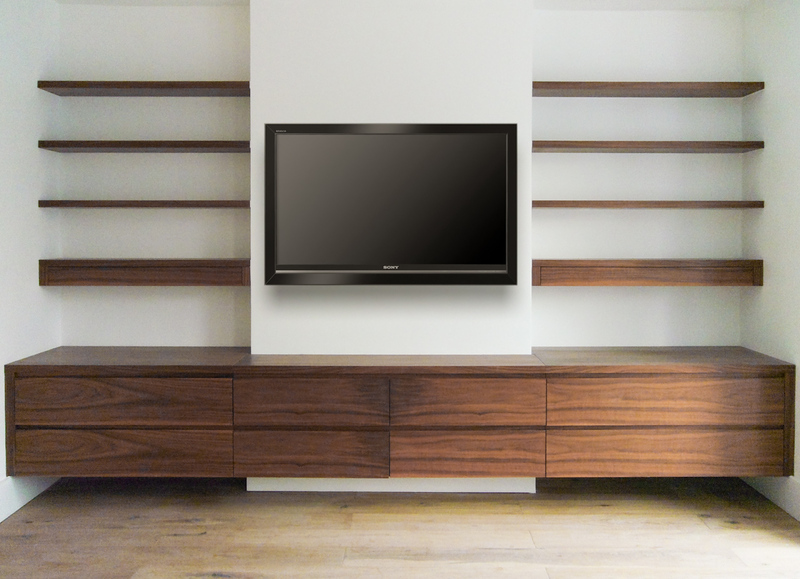 This custom built home entertainment unit has a fabulous architectural balance with the horizontal shadow line details. The combination of a bleached oak interior and a neutral spray lacquer finish to the external surfaces is a fine selection. This unit also incorporates pull out drinks tray and liquor cabinet. 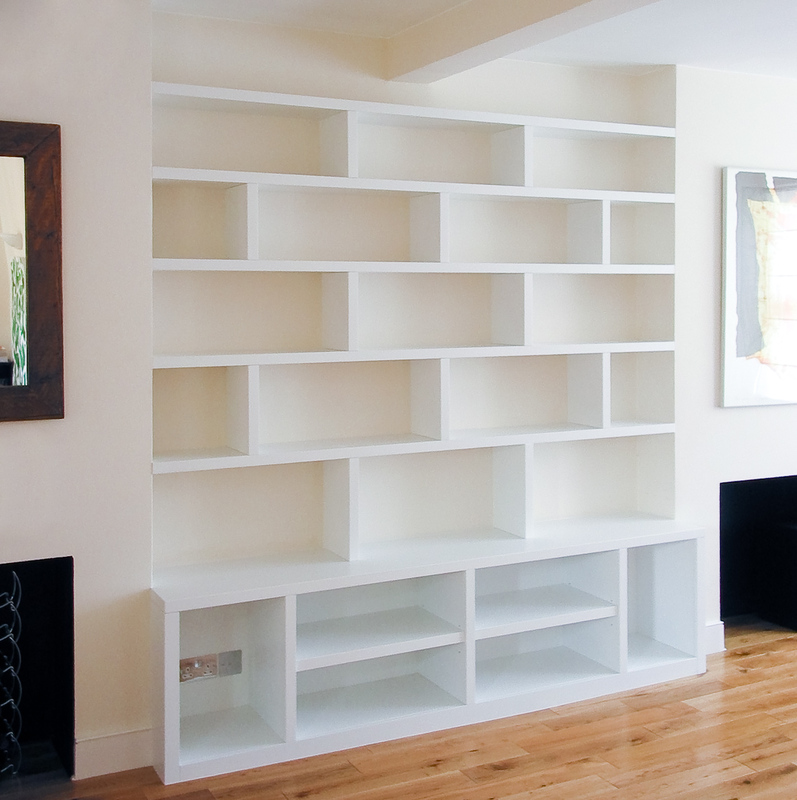 Look closely at this contemporary custom built shelving and home entertainment unit, you will see that the design incorporates a degree of asymmetry with the shelf dividers arranged in a staggered formation. Shown here in a light cream satin spray lacquer finish. The ultimate in home entertainment furniture. 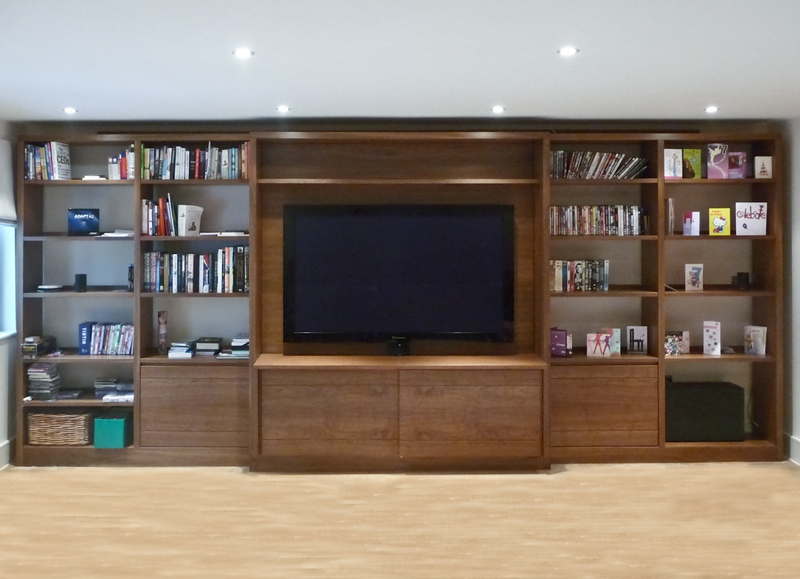 This 4.5 metre wide custom made and built in unit compliments the contemporary decor of this large family room with an abundance of open shelving and the electrical AV equipment is neatly hidden behind easy access sliding doors. 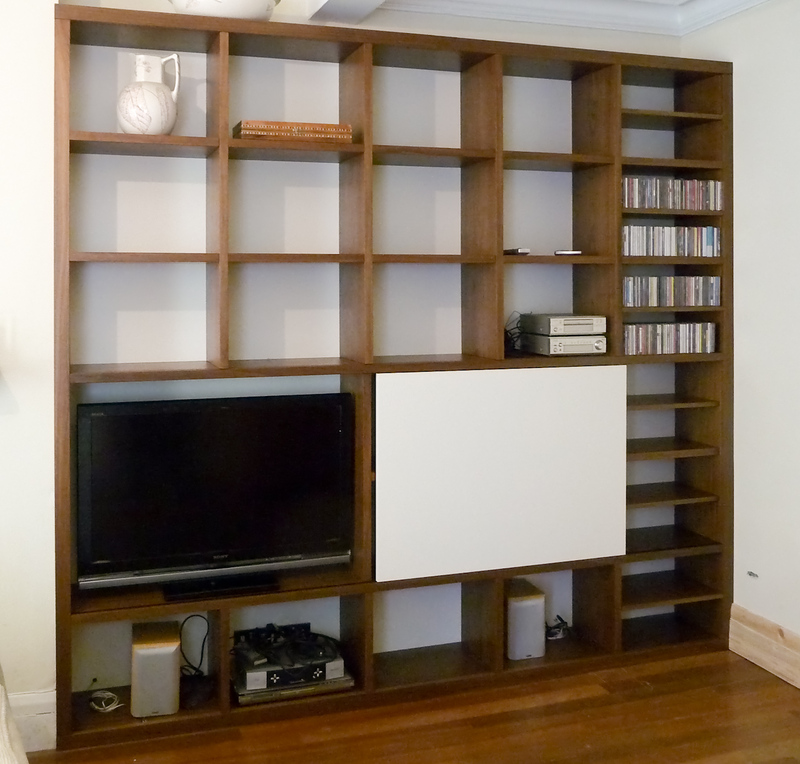 Modern bespoke shelving unit with media integration. 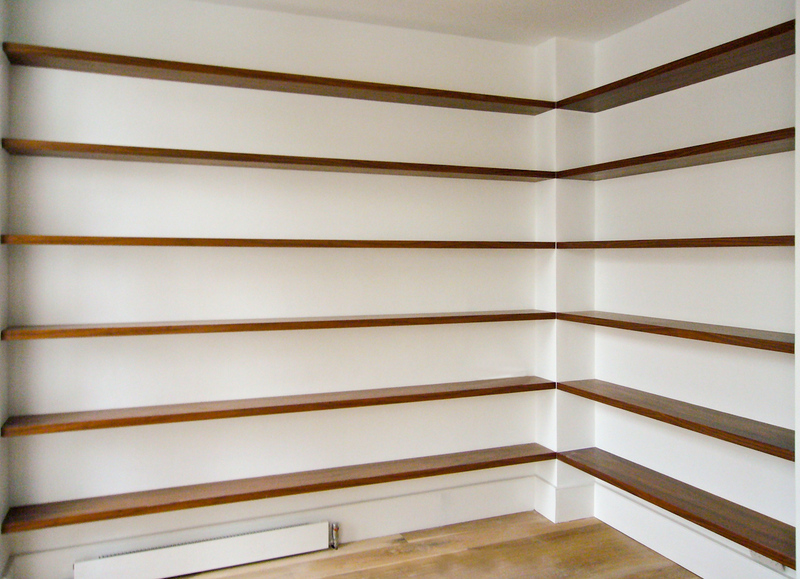 Shelves from a natural walnut veneer 30mm thick with solid walnut edging. 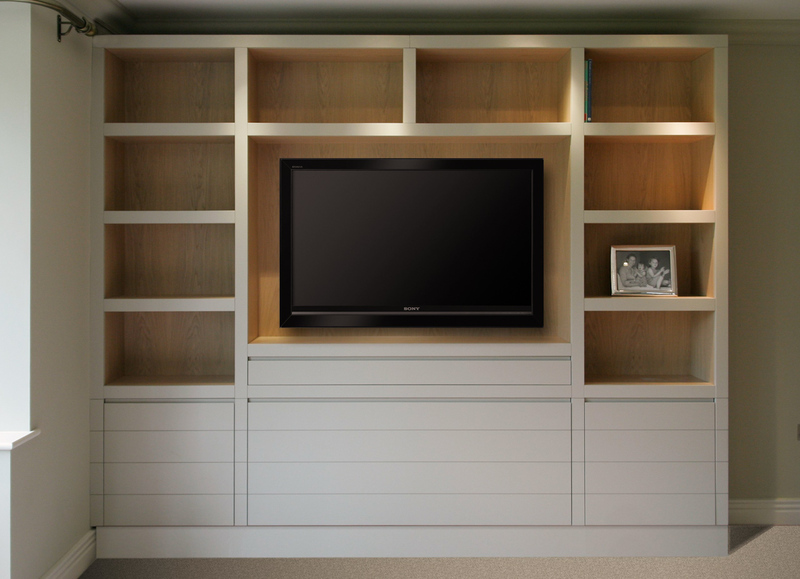 Sliding door to cover TV is in a light cream coloured satin paint lacquer.